Cardiff City Football Forum | Cardiff City FC Messageboard • View topic - UPDATED: " PREMIER LEAGUE TABLE APRIL 2018-19 "
" PREMIER LEAGUE TABLE APRIL 2018-19 "
Re: UPDATED " CHAMPIONSHIP LEAGUE TABLE 2015/16 SEASON "
" CHAMPIONSHIP LEAGUE TABLE 2015/16 SEASON "
" FINAL CHAMPIONSHIP LEAGUE TABLE 2014/15 SEASON "
" 2013-14 SEASON PREMIER LEAGUE "
CARDIFF CITY AVERAGED 26,430 CROWDS IN THE PREMIER LEAGUE. The wheels are held on by screws now and we're on life support. We'll be lucky to make the play offs now. Wippee we are unbeaten but drawing games and trying to beat records are pointless if you win f**k all. I'm next to the bookies and going to go large on Middlesbrough to win on Saturday. Houghton has done well but his substitutions are baffling as he thinks he can shut up shop when we're winning and hold on for the points and he hasn't worked out that it doesn't f*cking work. We're going to be in free flow down the table just like Derby and Nottingham forest in the past seasons. Finishing in the playoffs this year will be one of the biggest achievements any Cardiff manager has done for a very long time. Looking good, 7 games to go and the gap is closed to two points. Re: UPDATED " CHAMPIONSHIP LEAGUE TABLE 2016/17 SEASON "
Well Done to both BRIGHTON & NEWCASTLE . Re: UPDATED " CHAMPIONSHIP LEAGUE TABLE 2017-18 SEASON "
We're bang on course for 138 points!! Hoilett wins a free kick after ghosting past Leadbitter. Still no yellow for the Boro midfielder. 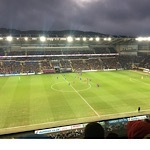 But the Cardiff fans are now making themselves heard as the Bluebirds get another chance to put the ball into the box. Morrison heads over. Patrick Bamford has replaced Ashley Fletcher for Boro.